Pick from any of these flavors, or let Mixon's select for you. MIXON'S SELECT - Let us select the most popular available flavors. GUAVA JELLY - A sub-tropical fruit that has a similar taste to a plum/peach combination. A great taste! Makes the best peanut butter and jelly sandwich...ask any Florida native. KEY LIME JELLY - Meet Florida's favorite lime, the Key Lime makes our Key Lime Jelly extra special tart and sweet. This jelly also make a terrific pie, just mix it with 8 oz. of Cool Whip then put it in a graham cracker crust. Our customers love this pie. KEY LIME MARMALADE - That famous Florida Key Lime taste in a tangy marmalade. ORANGE PINEAPPLE CHERRY MARMALADE - What a fabulous taste! Our own orange marmalade blended with pineapple and cherry to create a great taste treat loaded with orange peel, crushed pineapple, and blended cherries. A tropical delight! ORANGE MARMALADE - The ultimate marmalade! 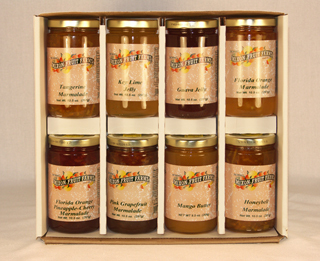 Made with fresh oranges to create a delicious, traditional, long enjoyed Orange Marmalade. Top your favorite muffin for a taste delight.